We are more than just photographers; we are life story narrators. We can bring out the best of your wedding moments and create a story in pictures that will last a lifetime or longer. You will be able to share your favorite moments with generations to come. We would be more than happy to capture your precious moment from your wedding at Bourne Mansion. When you book your wedding at this historic turn-of-the-century Vanderbilt mansion, you will have the full benefits of a sophisticated setting that offers a classical and traditional atmosphere for your formal wedding event. From an exquisite lawn event hosting over 1,000 guests to more intimate events hosting up to 300 hundred guests, Bourne Mansion has the facilities for it all. You and your friends and family will love the opulence and grandeur that harks back to days gone by. What’s more, Bourne Mansion is conveniently situated just 90 minutes from New York City. The staff at Bourne Mansion doesn’t do anything by halves, as you will see if you book the Grand Reception Package. You and your groom will indulge your guests in a sumptuous array of international cuisines. After the initial welcome with champagne and fresh strawberries, your guests will be able to choose from cocktails and butler passed hors-d’oeuvres. The main reception table will host a stunning selection of exotic fruit, artisan bread, country cheese and vegetable crudité. Your wedding dinner will not disappoint. You can choose from the Bourne’s delicious appetizers, as well as steak station, Asian station, pasta station, tuna station and more. And don’t forget a host of decadent desserts and your custom designed wedding cake. The Lawn: Admire the fantastic views of the Great South Bay and the surrounding landscape from the Bourne Mansion lawn. This stunning landscaped area can comfortably accommodate up to 1,000 guests. The Courtyard Patio: This majestic courtyard patio space is defined by elegant columns, making it an excellent space for hosting a cocktail hour. You and your groom can mingle with your guests and spend time with us taking your pictures. The Grand Ballroom: With its 40-foot vaulted ceilings and glass domes, the grand ballroom makes the perfect space for both your indoor ceremony and reception. The room comfortably accommodates 300 guests and allows plenty of dancing room. 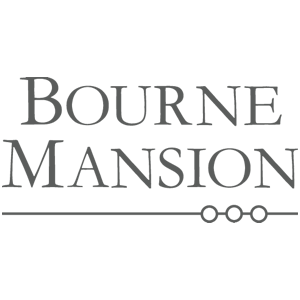 The Bourne Mansion offers a level of service that exceeds many other wedding venues. You will be given a personal wedding coordinator to help you liaise with vendors and to help you stay on track with plans. You will also be provided with a personal bridal attendant and a maître d’ for your reception. When you look through our extensive wedding portfolio, your senses will come alive, and you will be inspired by our sentiments and techniques. We would love to meet with you. Call us today and tell us all about your wedding plans.